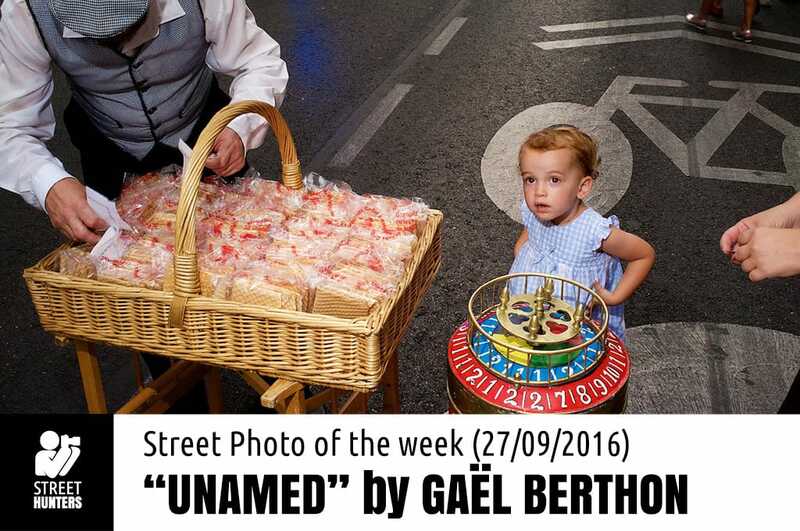 Gaël Berthon is a street photographer who is originally from Marseille and currently lives in Madrid, Spain. I was going through the Streethunters.net Readers Flickr group when the photo that we are featuring today captured my eye. I loved it and checked the name of the street photographer. I was pleased that I had made another discovery. Each time I find a new street photographer I feel invigorated and excited! It is a lovely feeling. I didn’t have much info to work on for this piece so I had to do some extra research to find out more about Gaël. What I found out is that Gaël works in Technology and photography is one of his passions along with music. He uses the original Fujifilm X100 with an external flash sometimes. That is all I could really find out, so I think it is best if you check out his work for yourself and let his photos do the talking. You can see more of Gaël Berthon’s photography on his Flickr account at https://www.flickr.com/photos/gaelberthon/ on his 500px acount at https://500px.com/gaelberthon on his Facebook page at https://www.facebook.com/gaelporlascalles/ or on his website at https://gaelporlascalles.wordpress.com. I really enjoy dramatic street photos and surreal captures that make me ask questions as to what is going on in a photo. If you have been following the “Street Photo of the Week” posts that I have been writing for nearly 3 years now, you will have noticed that I have a certain taste in photos. I tend to like photographs that make me wonder and feel as if they have a story or two to tell. When I looked at this photo I stopped dead in my tracks. My first cognitive tingling was “Realism”. This photo reminded me of the realism style of painting that was popular in the renaissance era. The colours, the lighting and that sweet angel faced little girl with her golden hair. Just looking at this image brought to my mind works of Raffaello and Michelangelo. Then I noticed the bicycle sign on the road that was perfectly placed behind the girl’s head and made her look as if she has a halo. I didn’t noticed the sign first because my mind is so accustomed to looking at art from that era that I took the halo for granted. I was confused by the composition that led my mind to believe that this was a painting. This lasted for the shortest of possible times, but it was a rush which I enjoyed! Then I noticed the light that was falling from the back of the road, which seems to be falling from above, as if bathing the little girl. The road’s lines are empowering the light’s direction, making it feel more heavenly. Warm, soft light on an angel faced girl, with a halo, as part of a photo with vibrant colours. Smashing I say! After I absorbed all that information I started enjoying the other elements in the photo. The coloured wheel that I have no idea what it is, but looks old and like something that could have existed in the renaissance. If anyone knows what it is, please share the info in the comments below. Then, the man, dressed rather stylishly but in clothes that could suggest a different time than the present, selling what appears to be some sort of traditional delicacy. Gaël must have used a flash to achieve this result and he has done so masterfully. This is the reason why the colours are so vibrant too. What a fantastic photograph. I just can’t get enough of it. As you know, every week (or so) we feature a photograph of a Street Photographer on our website. The Street Photographer that is featured is selected by the Street Hunters team. 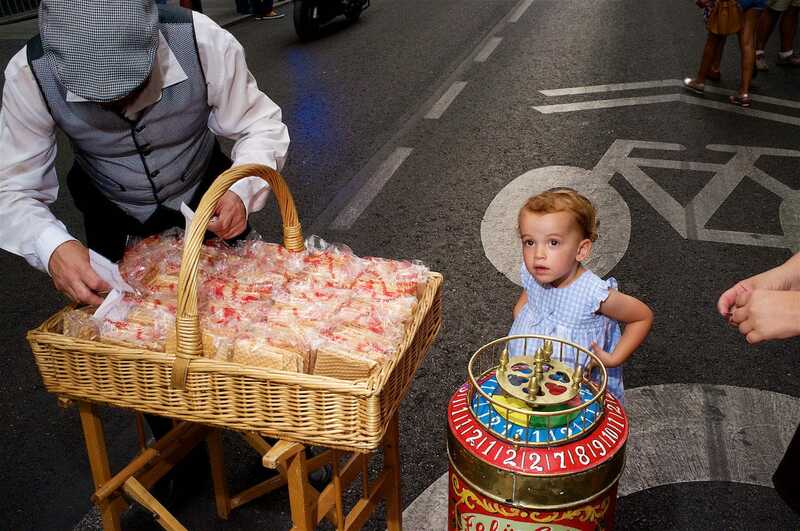 The “coloured wheel” is a metallic basket where the “barquilleros” keeps the “barquillos”. The barquillo is a kind of traditional, long and cylindrical, biscuit made with flour, sugar or honey and cinnamon, and it is very common in Madrid local fesitvals. The man is also dressed with the traditional costume of Madrid, known as “Chulapo”. On the top of the basket, there is a game similar to roulette, who loses pays the barquillos. Thank you very much for the useful information Carlos. Much appreciated!